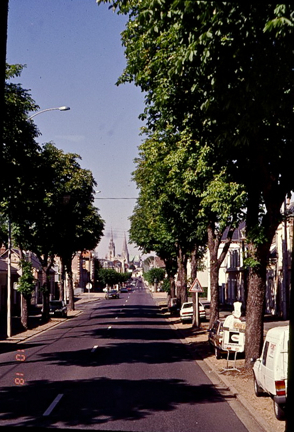 This small town is about 100 kilometers (62 miles) southwest of Paris, located in the Department of Eure-et-Loir, in the region known as Beauce. 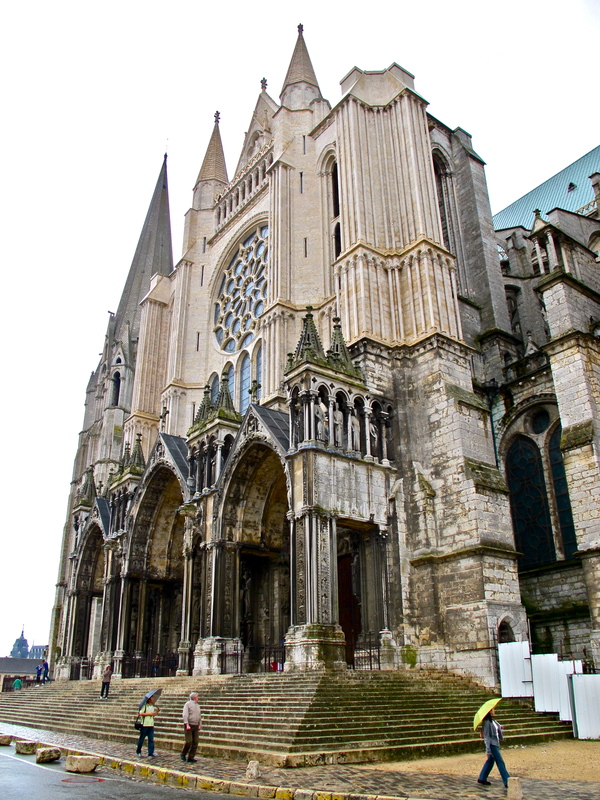 It is perhaps the second most famous cathedral in France. 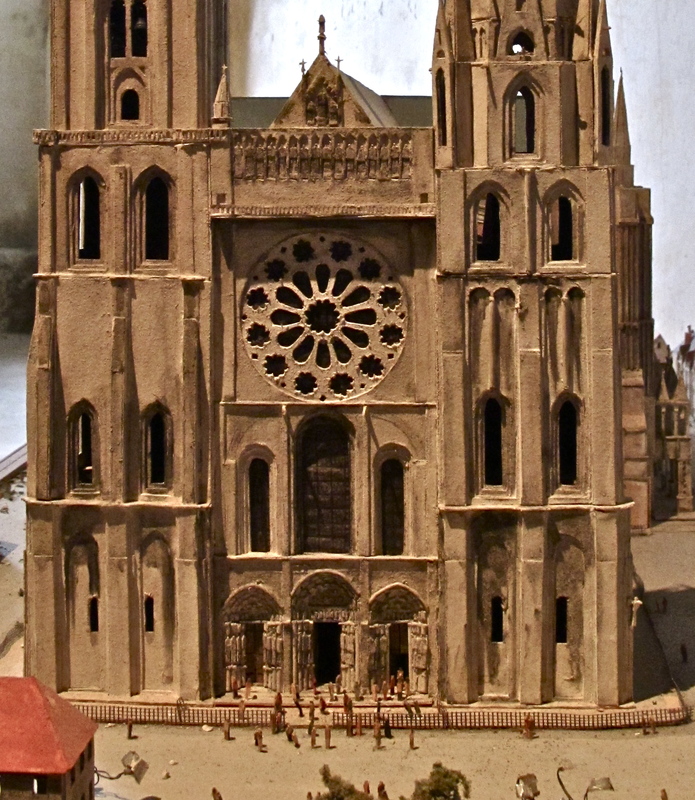 The Cathedral of Notre Dame was built on the site of earlier churches devastated by fires in the 8th, 9th, 11th, and 12th centuries. 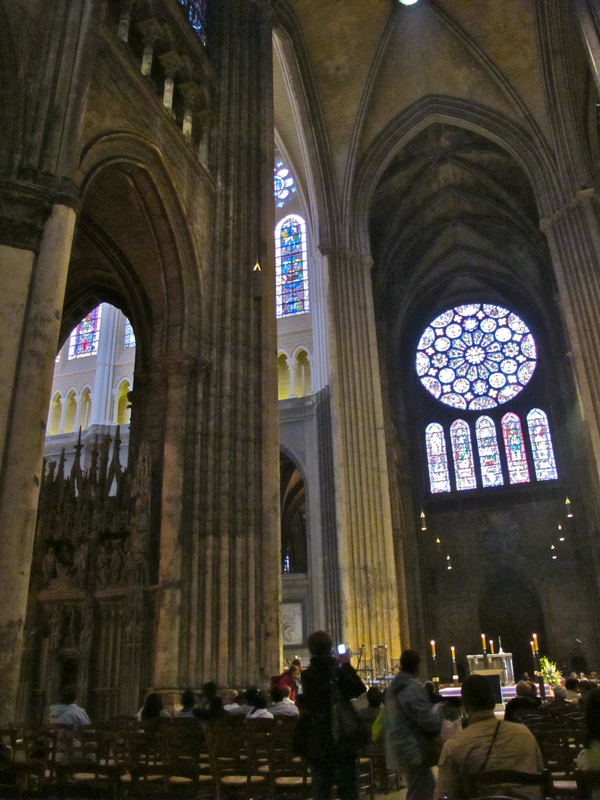 In fact, most of the nave and side aisles were erected between 1195 and 1220, with consecration taking place in 1260. 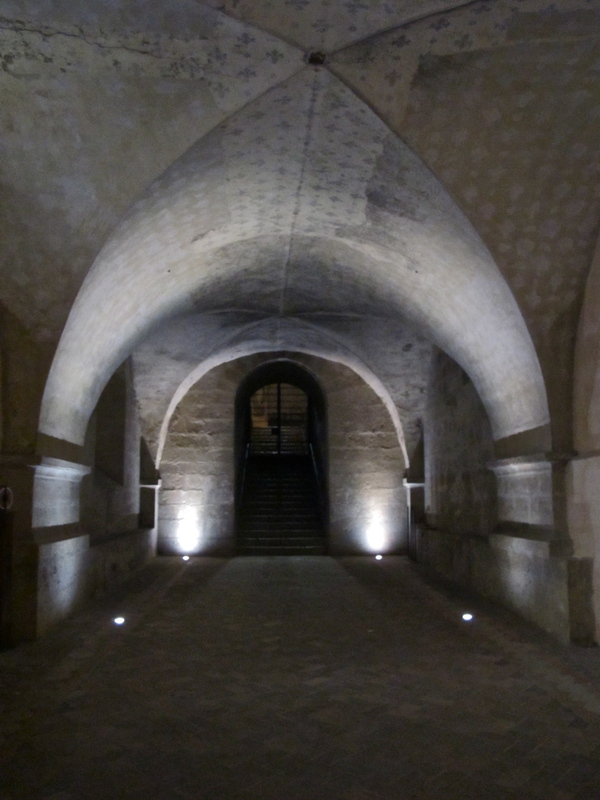 A Romanesque crypt still remains beneath the cathedral, dating from Carolingian times- about 1024 – and is the largest crypt in France. Here the two western towers. We shall discuss each separately. There was a fire just prior to the present design construction in 1194, and the south tower on the western façade did survive that fire. 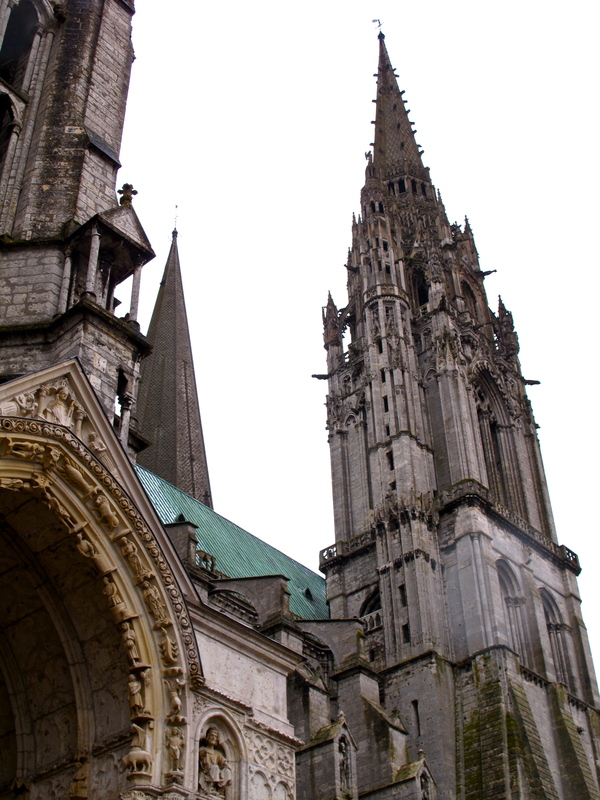 That tower, Clocher Vieux (old bell tower), dates from 1170, and is described by some as being “pure Gothic.” The spire atop the tower, in its simplicity, is devoid of crockets and gargoyles. 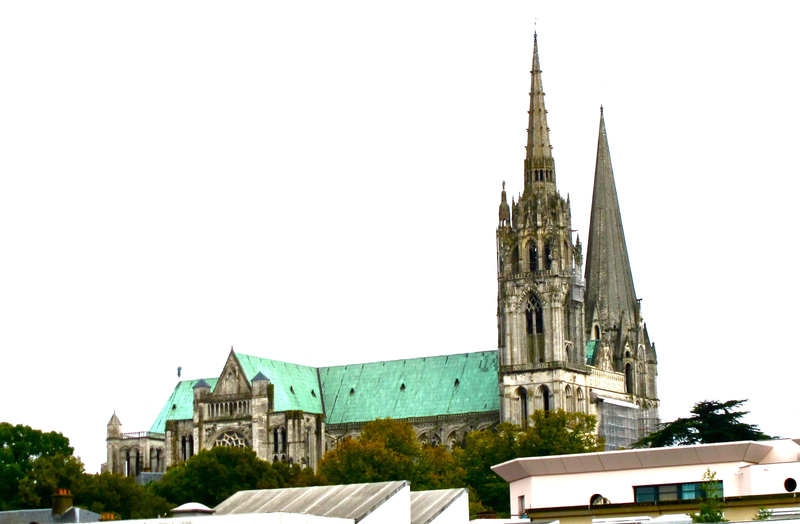 Here viewed from the south, the spire is simple, octagonal in shape, with no piercing, and reaches a height of 105 meters (344 ft.). 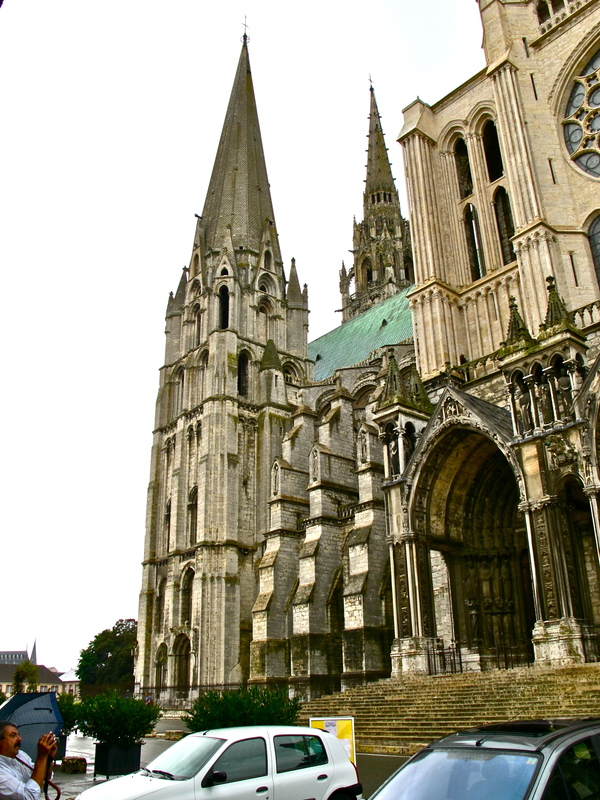 It looks very much like those on the Abbaye aux Hommes, so we have something that actually looks more Romanesque than Gothic, until you examine the lower half under the spire.. 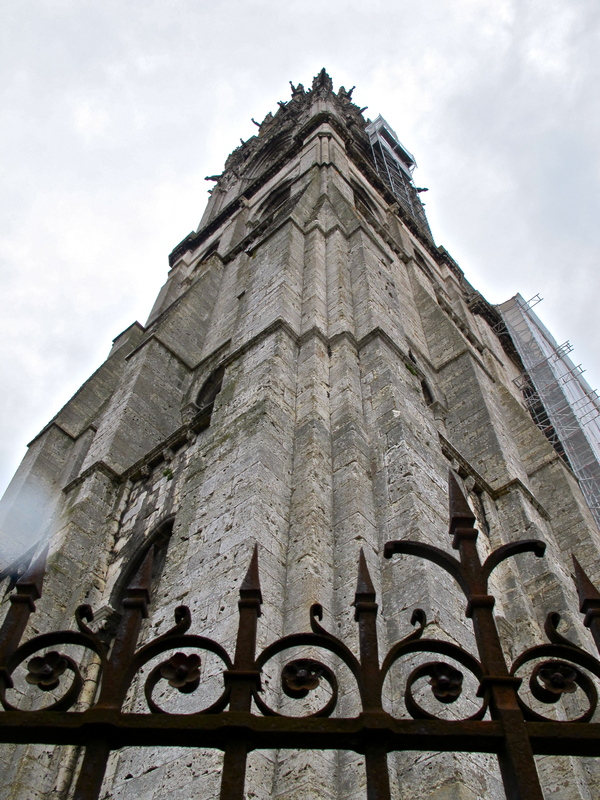 This north tower, as viewed from the north, the Clocher Neuf (new bell tower), very much contrasts with the south tower. 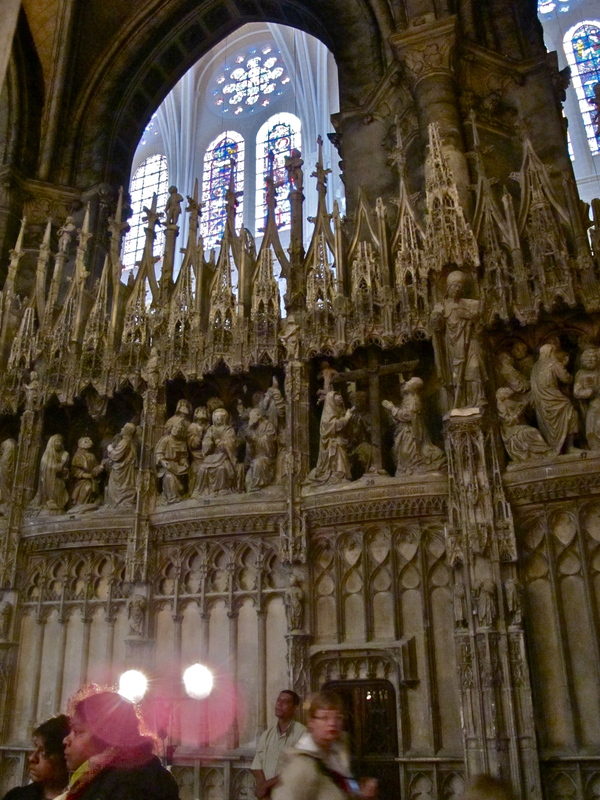 Built in the early 16th century it is very lace-like, contains crockets and gargoyles, and actually looks very Gothic. As with many designs throughout history, additions were built in the style of the moment. 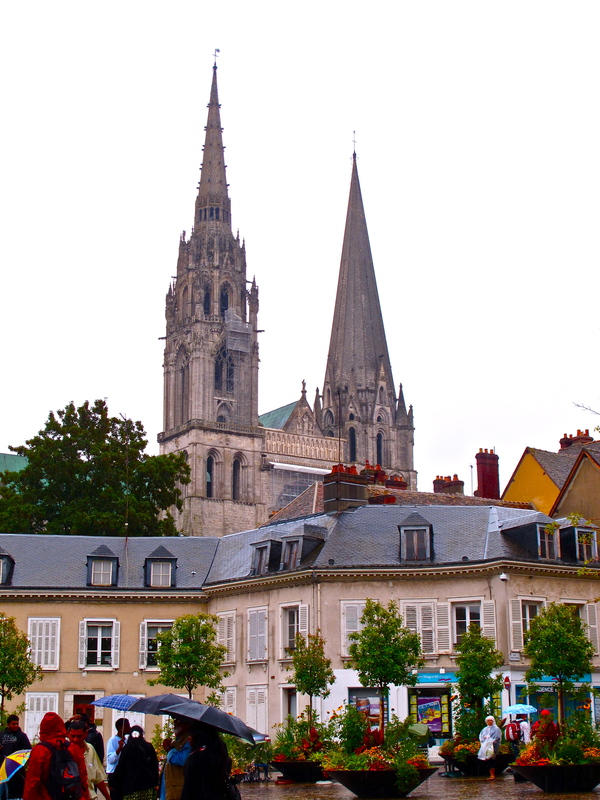 Here at Chartres, though the styles are so very different, there seems to be a psychological balance. The taller spire is open to the sky, and this seems to lighten it considerably, and in a way balances the smaller, simpler, but more solid older spire. It reaches a height of 113 meters (370 ft.). The multitude of verticals enhances the height achieved. 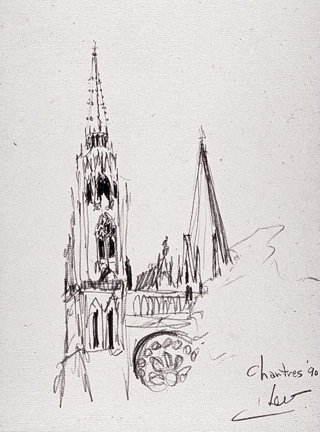 Here a drawing from the church illustrates the relationship and the differences between the two towers. There are some who might argue that the disparate towers are more interesting that a matched pair, built at the same time would be – it is all in the eye of the beholder. Think back to Notre Dame in Paris (above), and try to imagine how that church would have looked if only it had had spires. 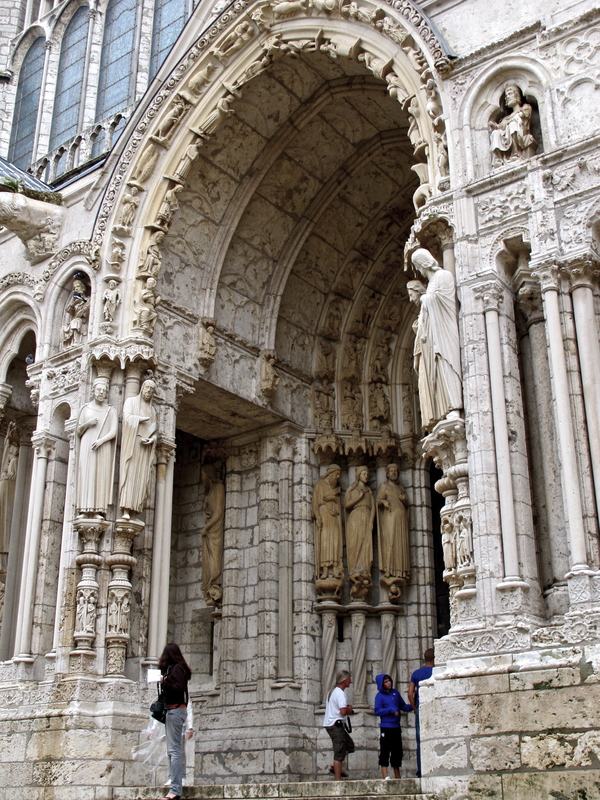 The main portal in the western façade is known as the “Royal Doorway,” and is decorated with statues, which became models for other churches. Two visits, two completely different skies. My apologies. The most recent visit featured scaffolding over the central portion of the facade. 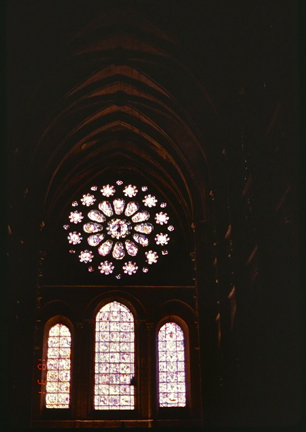 The rose window, as seen from the interior, measures 14 meters (46') across. A model inside the crypt best explains the western facade. Note the three doors are all placed within the central motif, under the rose window. 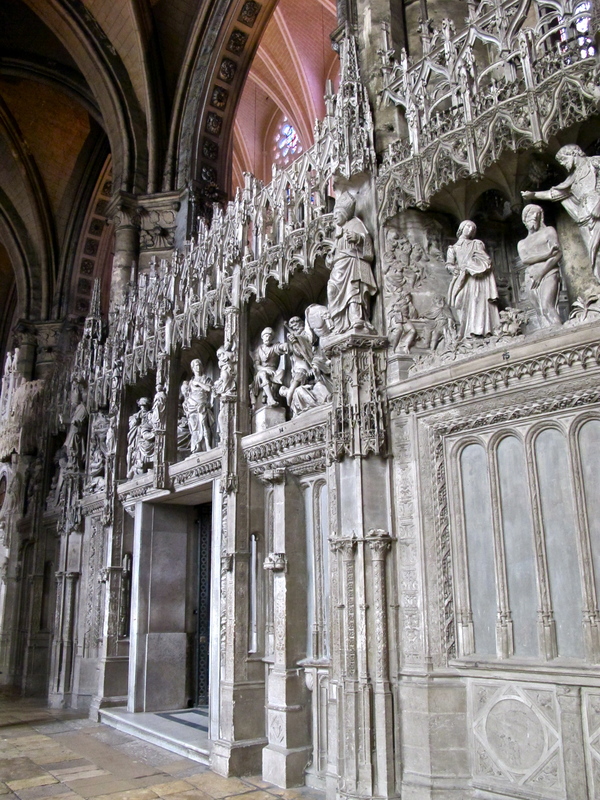 This is rather unusual, in that most churches will indicate, by the number of doors, the number of aisles within the church, and in the least, the southern and northern portals of the western facade are placed within the towers at the corners. Bear this in mind when we discuss the various portals. 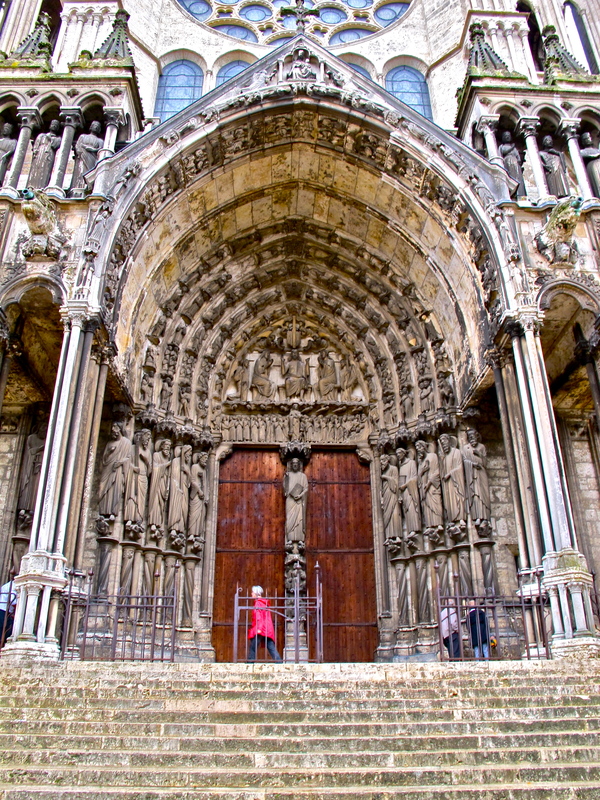 A description within the church states that the “Royal Portal” as they choose to describe it, and the three lancet windows above, survived the fire of 1194, and these elements were integrated with certain modifications into the new Gothic structure. A new rose window was added. 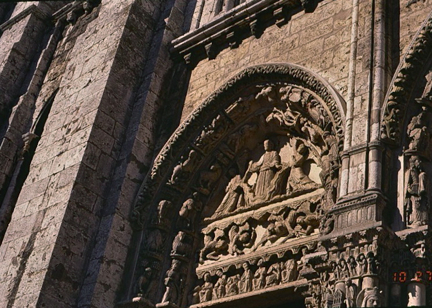 The South portal of the western facade is a sculpture depicting the Last Judgment. 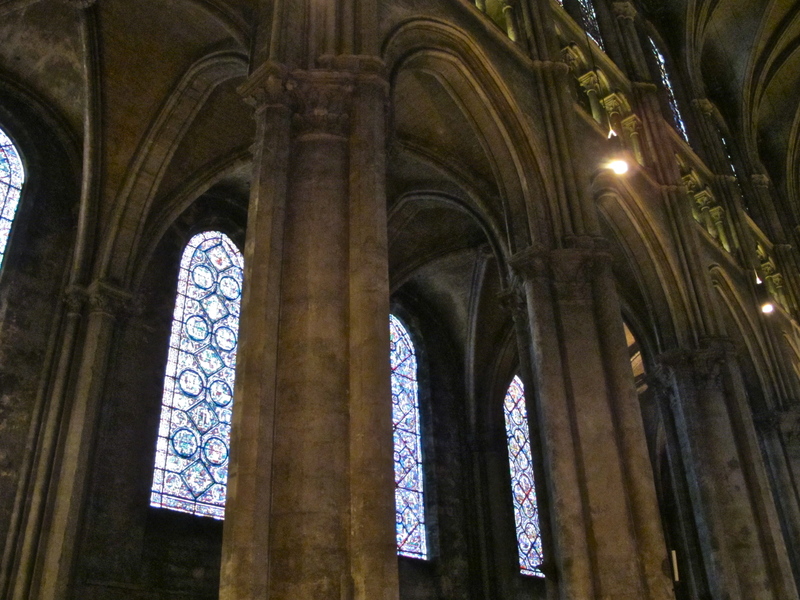 The south transept features three portals, as does the north transept, something rather unusual, giving Chartres nine entrance portals. This transept allows you to walk between the outer columns and the tympanums, almost recreating the old narthex concept. It becomes obvious that an actual porch has been created, as all three tympanums have been built out beyond the transept. In fact, this transept looks like a church in its own right. The upper level is obviously recently restored, while the lower level awaits. 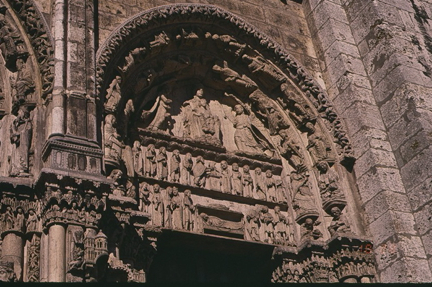 The Ascension of Christ, angels, and a row of ten figures assumed to be apostles, are presented on the North portal. Houses directly across the street from the South transept, and the Place in front of that transept. 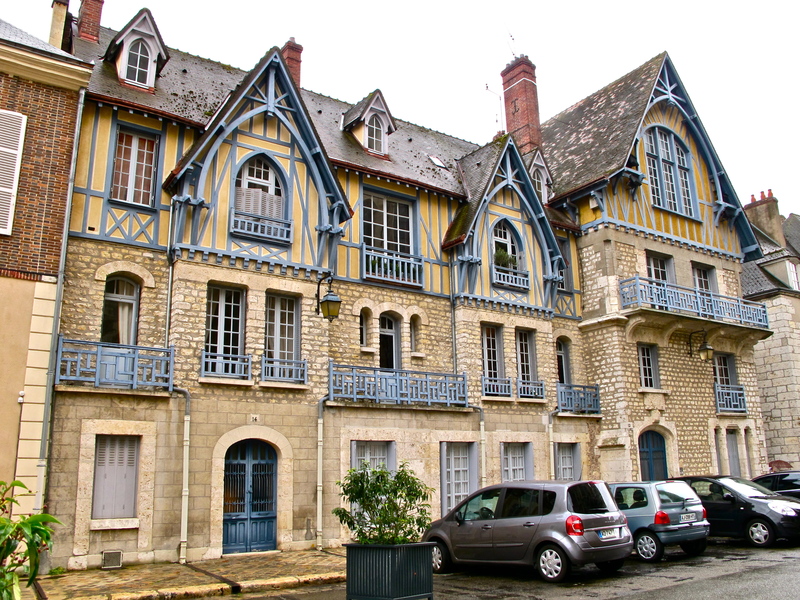 There has been an attempt to “gothicize” the buildings with metal struts applied. 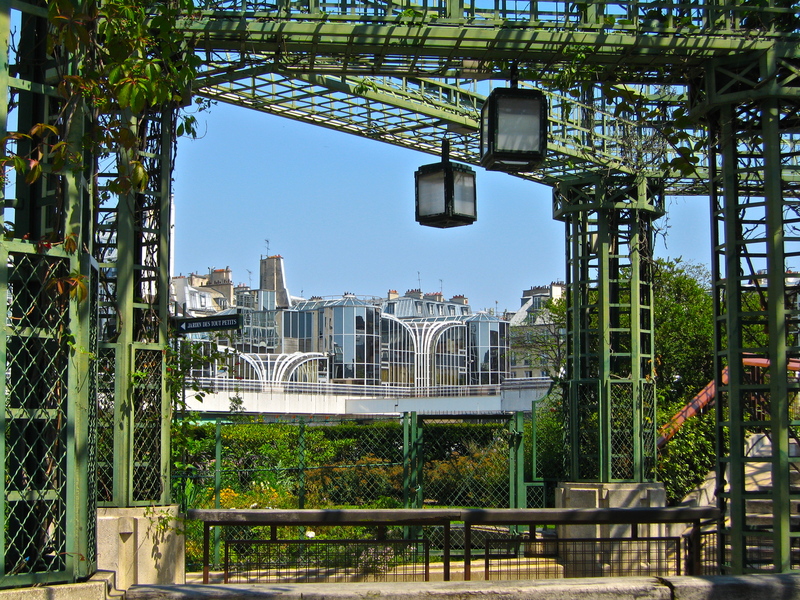 The Forum des Halles in Paris, which opened in 1986, is a similarly designed creation, making a transition from old Paris to the new, with obeisance to a nearby Gothic church, Saint Eustache. The three levels of the houses begin with a stone trim around windows and doors, and incised stucco, simulating stones. The second level is a rustic stone, and the top floor is half timber. We shall see similar demarcations in Italian Renaissance designs, though they start with rustic stone, topping the upper levels with finished stones. 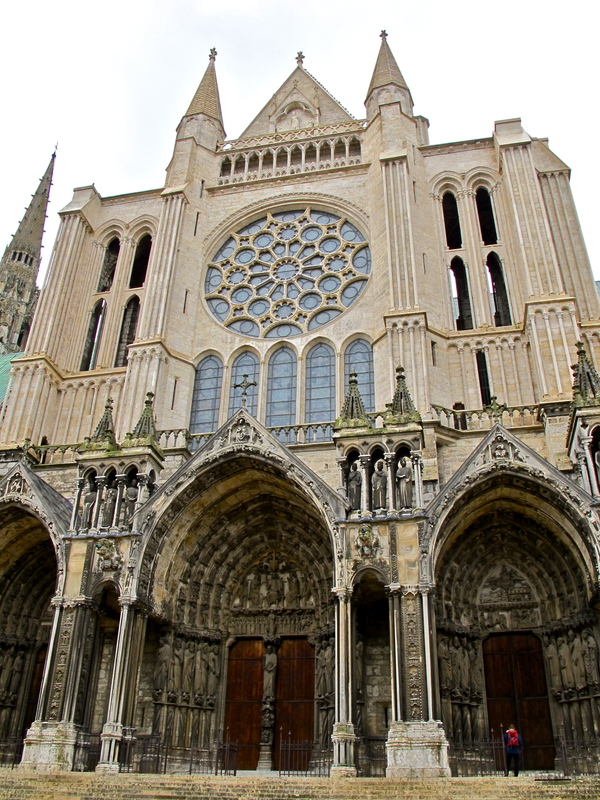 Back to Chartres, where we see that the north transept portals are quite similar to those on the south. Here we can better glimpse the clear passage from one portal to the next. Notice also how sculpture permeates the entire area, perfectly integrating art with architecture, and in this case with story-telling. 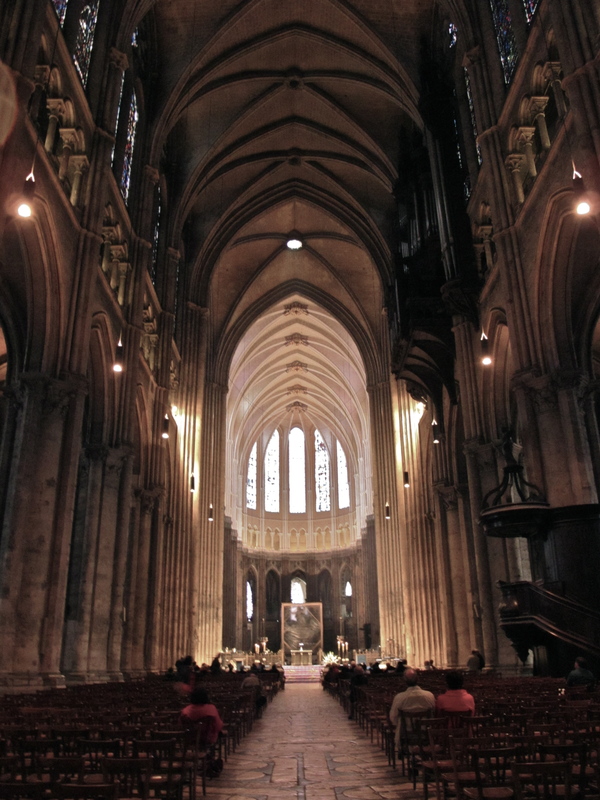 Dimension-wise, the three-aisled church interior is 130 meters (427') long. 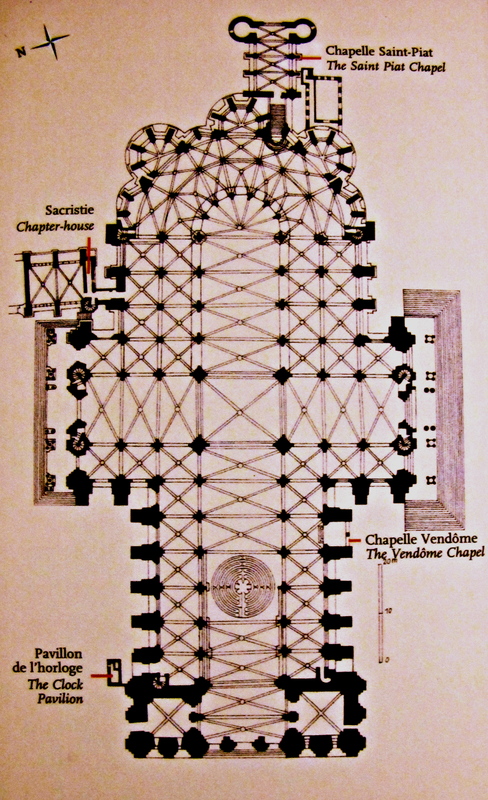 The nave and the side aisles combined measure 32 meters (105') in width, and the width including the transept portals is 46 meters (151') feet. 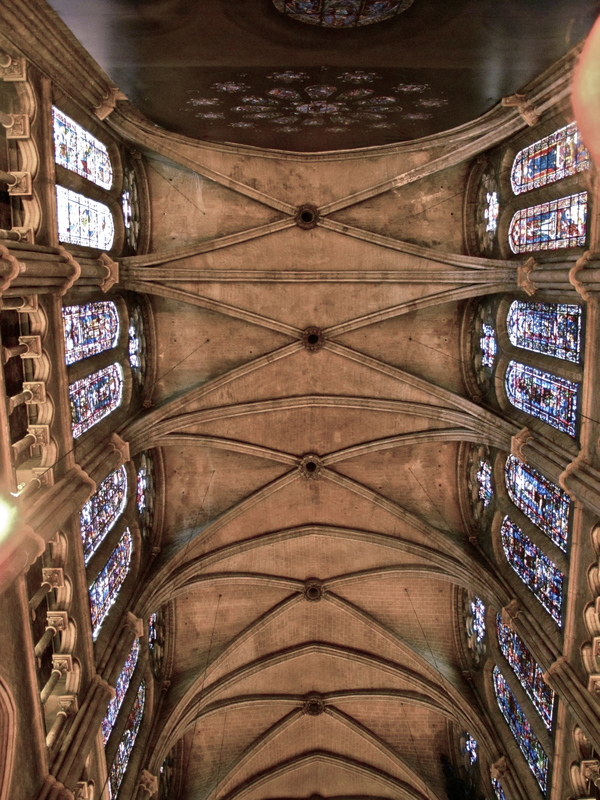 The underside of the stone vaulting in the nave is 36.5 meters (120') above the floor. Notice we are now 3.01 meters to 4.6 meters (10 to 15 feet) higher than Notre Dame in Paris. 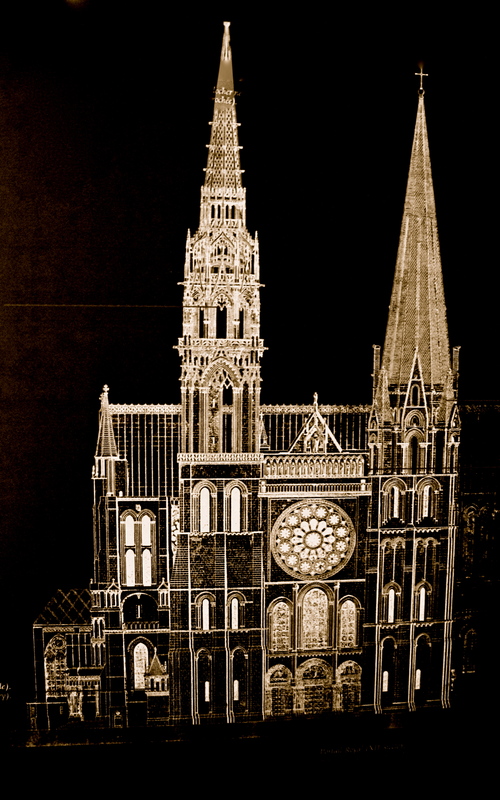 As the Gothic movement developed, structures became taller. 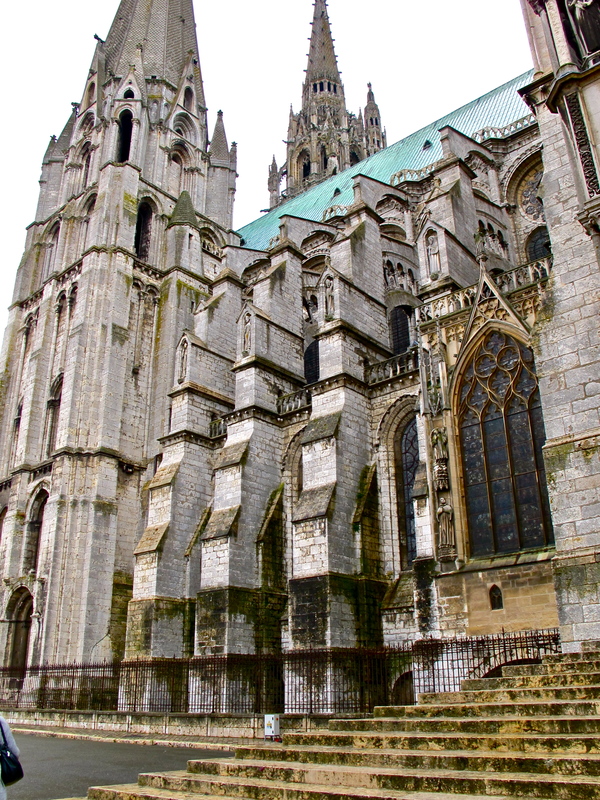 Flying buttresses are composed of three levels, one over the other, and the two lower levels are connected by radiating balusters, which appear to radiate out of a central point, giving them flowing grace. 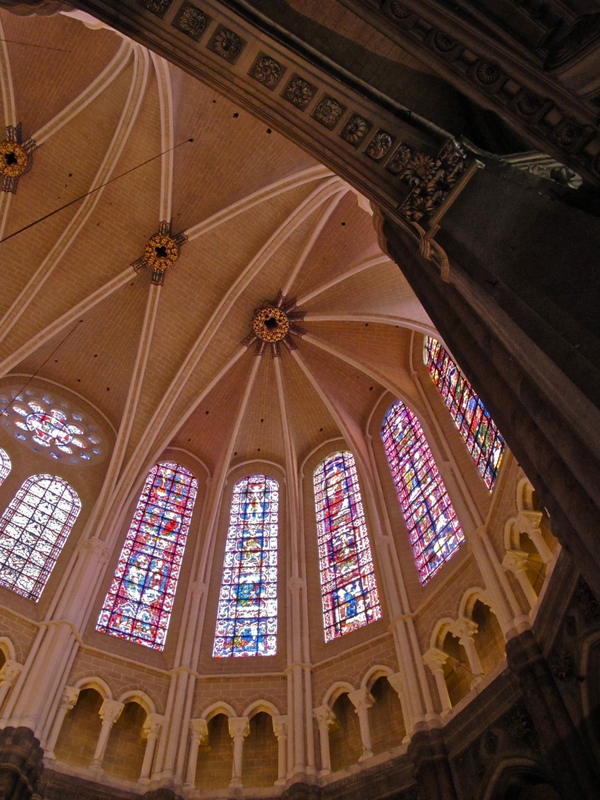 This and other aspects of Chartres seemed to symbolize an escape from gravity and, also, of the spirit, soul, and material existence of man, radiating and stretching upwards towards the heavens. Inside again, as we view the nave, and a new form of vaulting. The side aisle columns have been taken to the roof of the nave, forming a narrow bay of ribs running across the nave, at right angles to the nave. 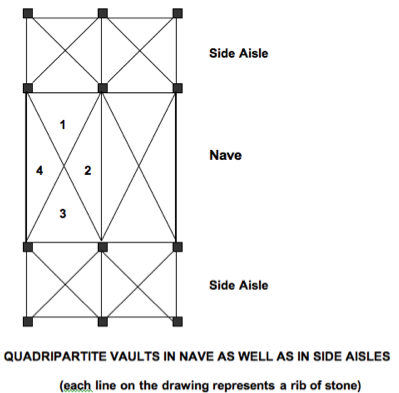 The quadripartite vaulting actually reverts back to earlier four-part stonework, by eliminating the central column used to support smaller side aisle construction. 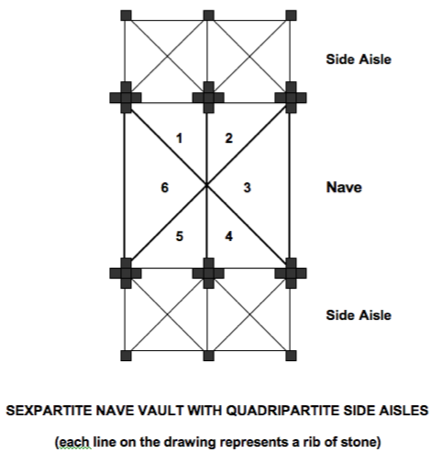 Remember the sexpartite example in Paris, which resulted from the nave vault being the size of two adjacent side aisle vaults, resulting in a center rib. 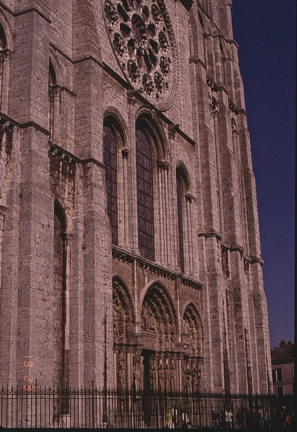 This resulted from the vaulting of the nave becoming a narrow rectangle in depth, west to east, but wide perpendicular to the length of the nave. It is credited with eliminating the smaller support between major roof supports. 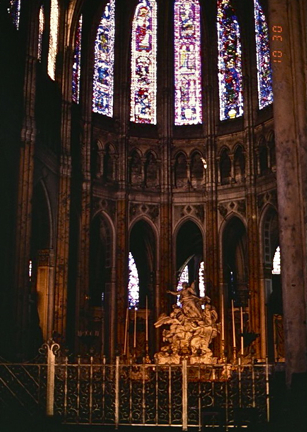 Historians have viewed the sexpartite alternating column sizes in the nave as perhaps stultifying, and positive critiques of this – we could call it “retro” style or old approach revisited – exclaim the staccato effect of narrow bays, as seen above – front to back - as being much more dynamic and visually moving. Our eye now goes from narthex to altar in a more rapid manner. This change has been viewed as a simplification, and often when elements are minimized and simplified, greater effects result. Again, Mies van der Rohe’s dictum: “less is more” is appropriate. In architectural design, as in probably most other fields of endeavor, the simplest solution is often the best, yet it is the most difficult to achieve. 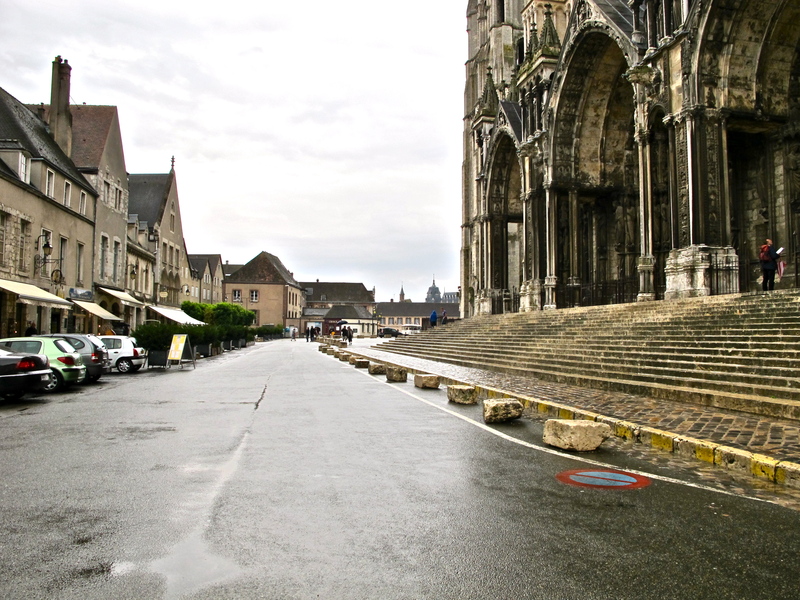 Something new at Chartres is a combination of cylindrical pier and ribbed articulation. In Paris we saw ribs mounted on cylinders. Here the two coexist, with the core cylinder evident between soaring ribs. Thus we have the origins of the column or pier surmounted by the newer technologically-revealing ribcage supporting the vault construction. The vaulting overhead. Notice that here the triforium gallery contains four arches. As in Notre Dame de Paris, there is a statue of the Virgin (Notre Dame de Pilar), situated to the left of the choir enclosure in the nave. The statue is elevated on a column, or pillar, venerated as a miracle-working statue; it dates from 1510. 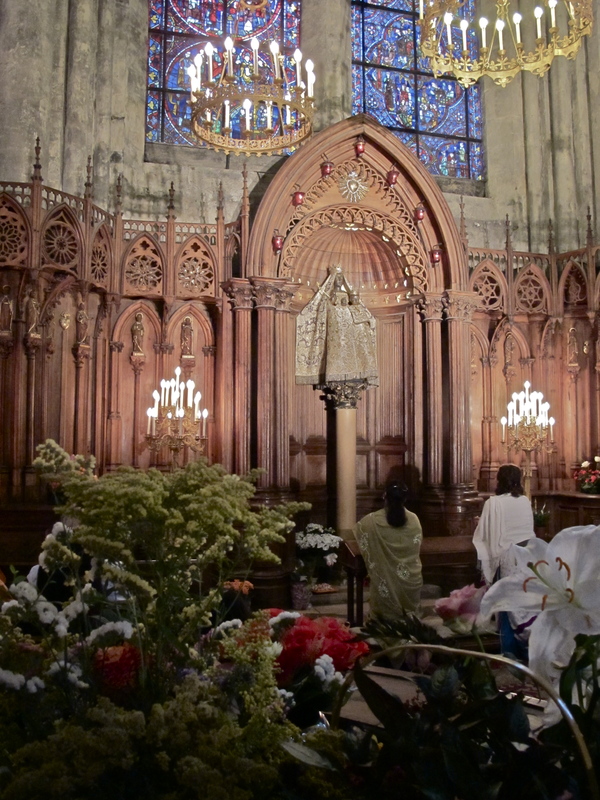 "Our Lady of the Pillar," is actually a Black Madonna, and there is controversy within the church orthodoxy as to the origin of the Black Madonnas. Some sources indicate a pagan origin, perhaps going back to Isis in Egypt, and the seven red lights on the arch over her head, accompanied by the white radiant symbol lead some to believe the origin is that of a dark companion to our Sun, a dwarf star or planet. 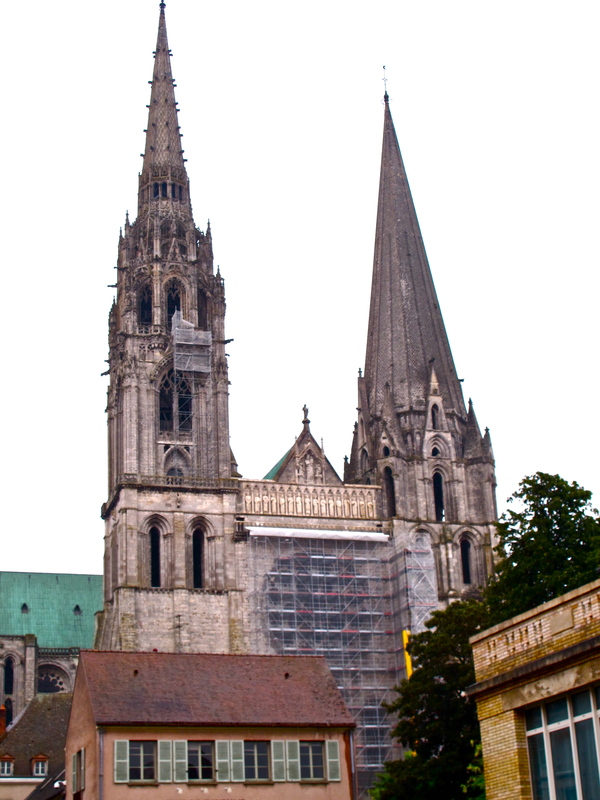 You might want to explore this site, though I bear no responsibility for its content: http://www.darkstar1.co.uk/chartres.htm. It is just curious. 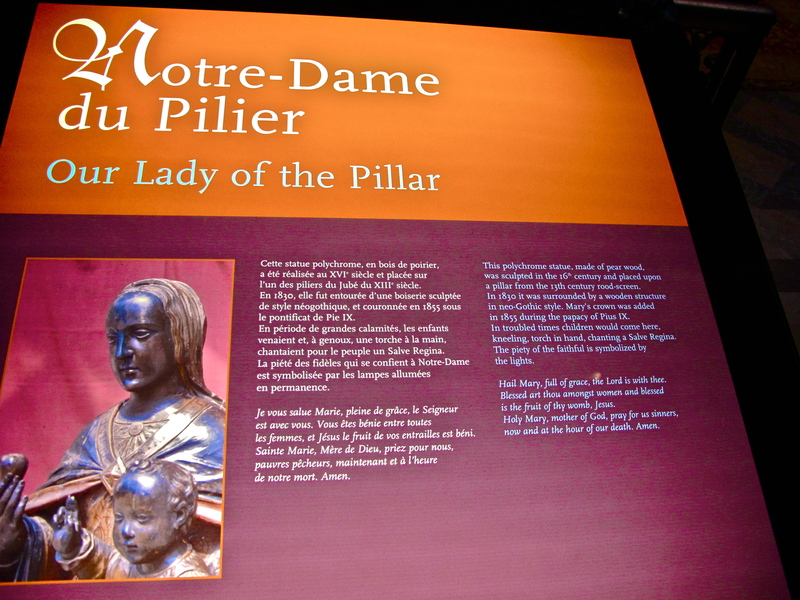 Below is a church display describing the Lady of the Pillar. View from the north transport looking across to the south transept, with the choir on the left, to the east. East of the crossing the church has two side aisles comprising the ambulatory, which merge into the apse behind the altar. The east end of the nave, with its altar piece. This view taken immediately above the altar piece shows arches radiating from a center boss. It is beyond these arches that there are five radiating chapels, and an extended construction known as the Chapelle St. Piat, created in the 14th century. 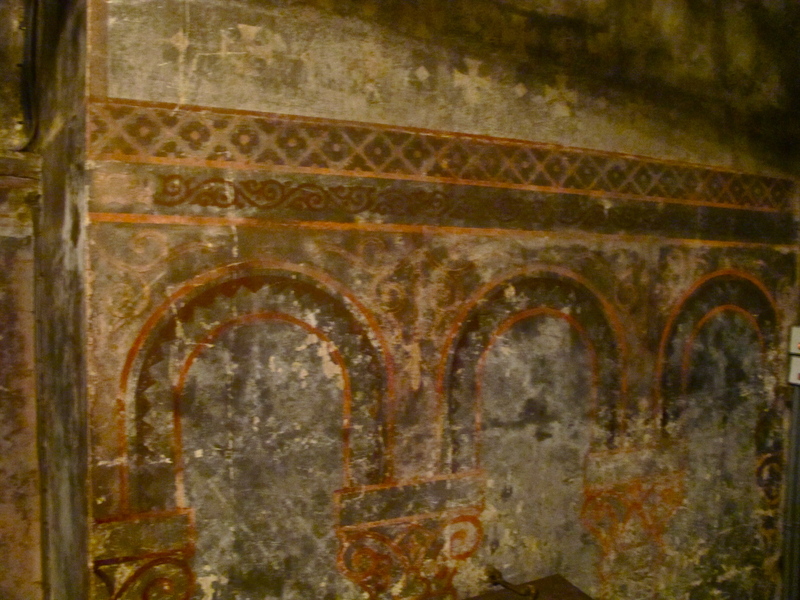 One of the radiating chapels in the apse. 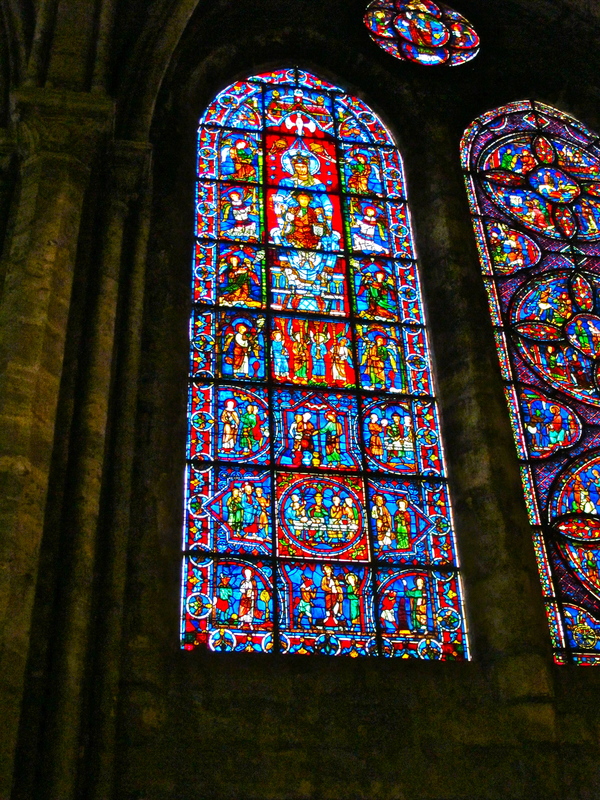 There are over one hundred sixty windows, all of stained glass, a statistic remarkable even in France. 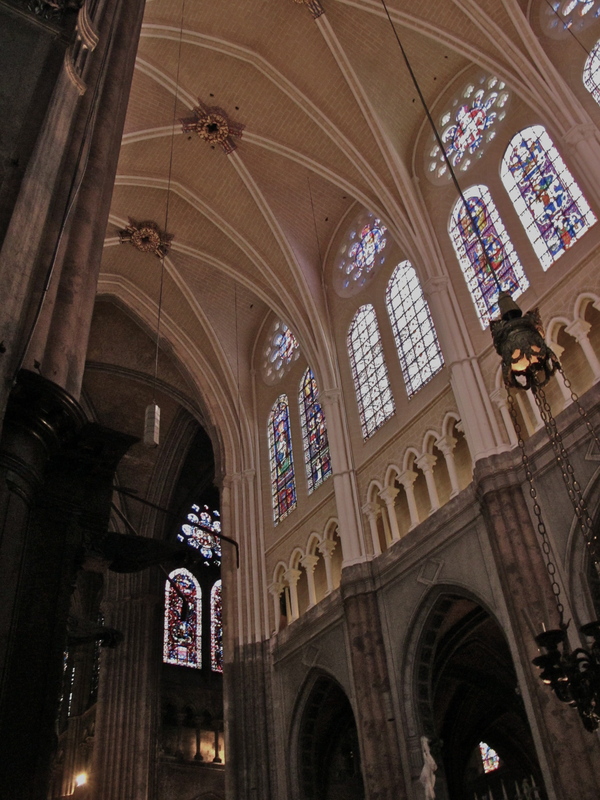 One source indicates there is an estimated 2,000 square meters of stained glass windows in this church. That would equal 21,528 square feet. An assignment would be to track down this measurement – the source being quoted presents the measurement as being in cubic meters, which is questionable; it would be reasonable to assume square meters as above. Again, it is little mysteries or sometimes discrepancies such as this, which require a bit of discernment, and detective work. There are 12,000 scenes narrating religious history. 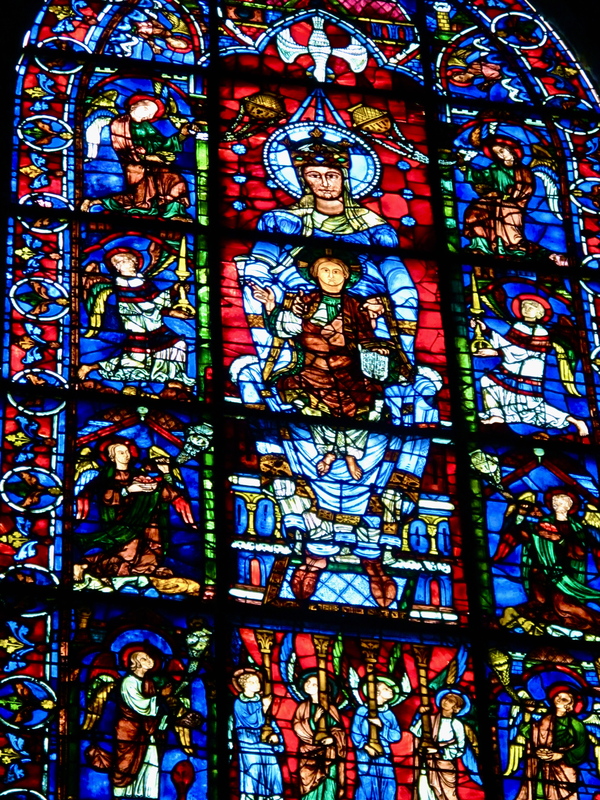 Special in this church is the panel depicting what has been dubbed “The Blue Virgin,” because of the coloring, though the French is “la belle Verrière,” which translates to “the beautiful stained glass window.” Mary, dressed in blue, is shown framed within red panels. 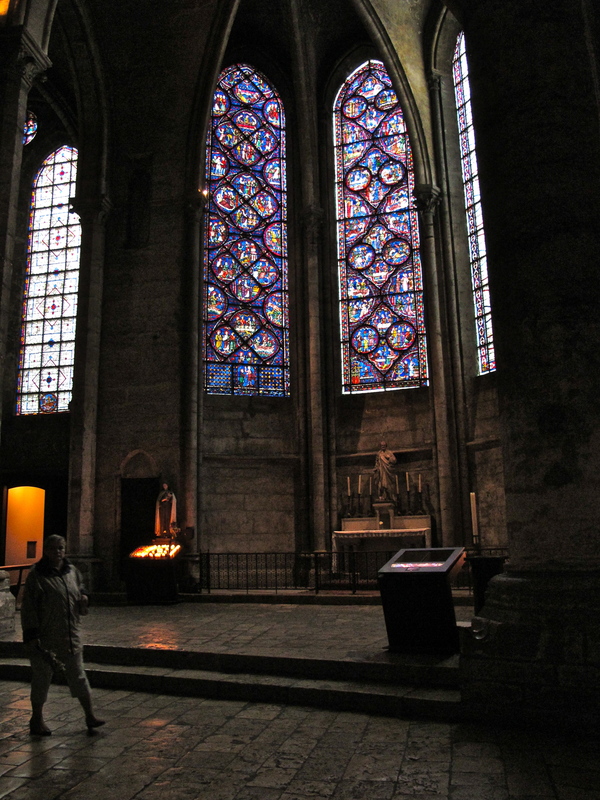 The panels survived the fire of 1194, and were then inserted into an early 13th century window. The quality of the blue glass is derived from cobalt oxide. 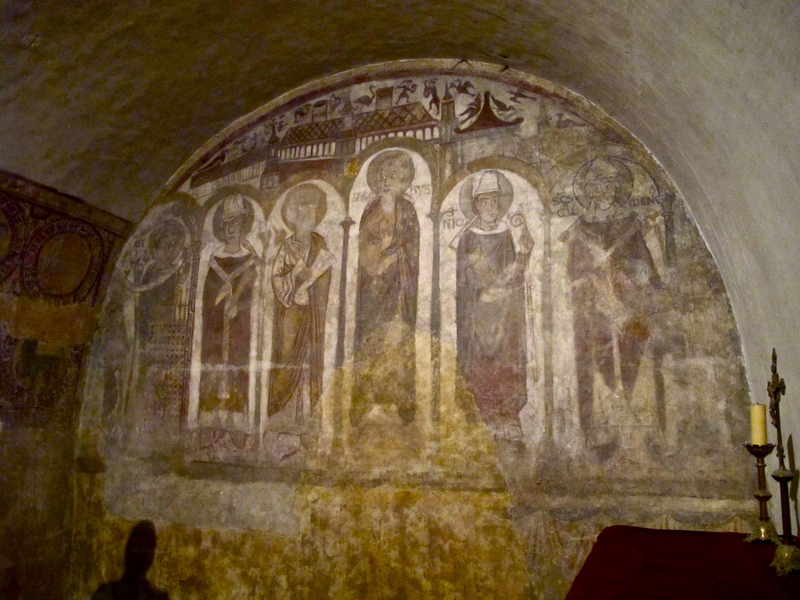 The crypt, mentioned above, is vast, and reflects the 11th century Romanesque church. 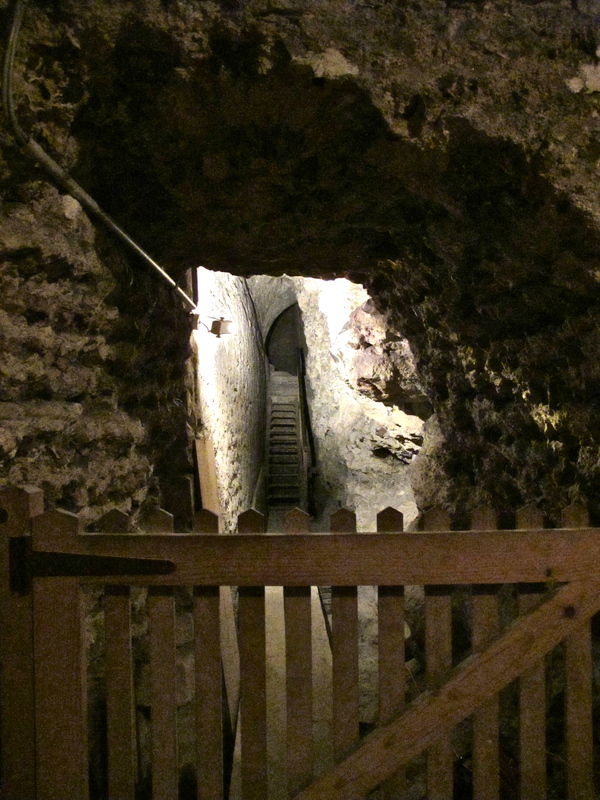 The crypt was probably intended for processions and pilgrimages. 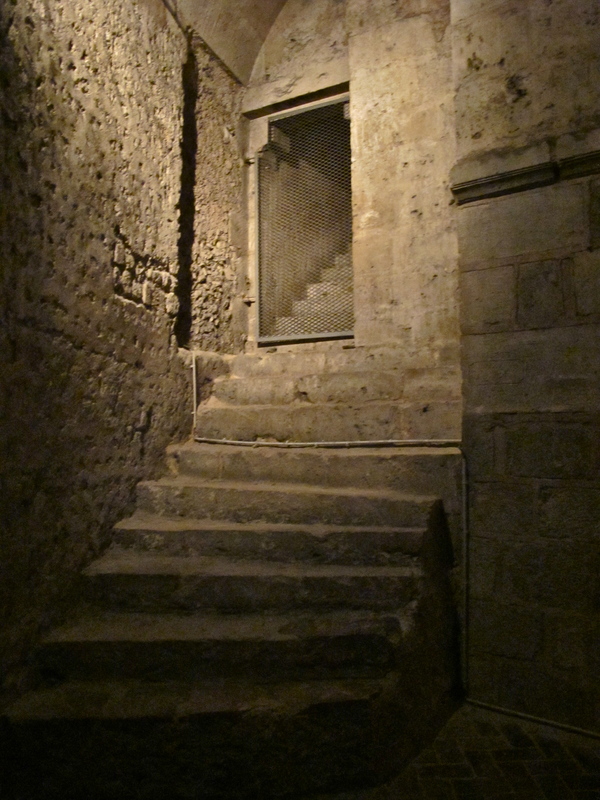 Descending into the crypt, reveals a serious of passages and a number of chapels. Construction ranges from 11th century barrel vaults to 13th century groin vaults. 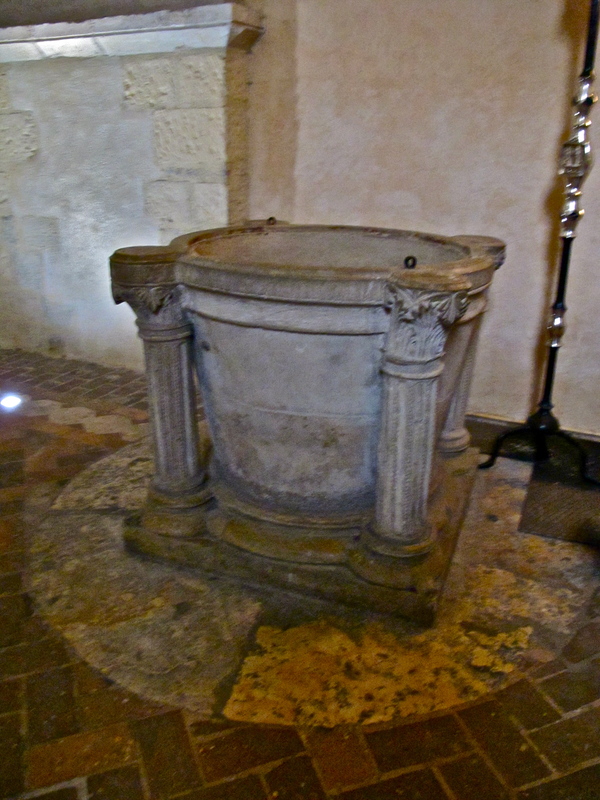 The baptismal font dates from the 12th century, and is still used for christenings. These frescoes date back to the 12th century, and bear witness to the long history of the integration of art with architecture. Honestly, a student challenged me to do a sketch in 10 minutes, and this is the result, though it seems it should have taken less time. 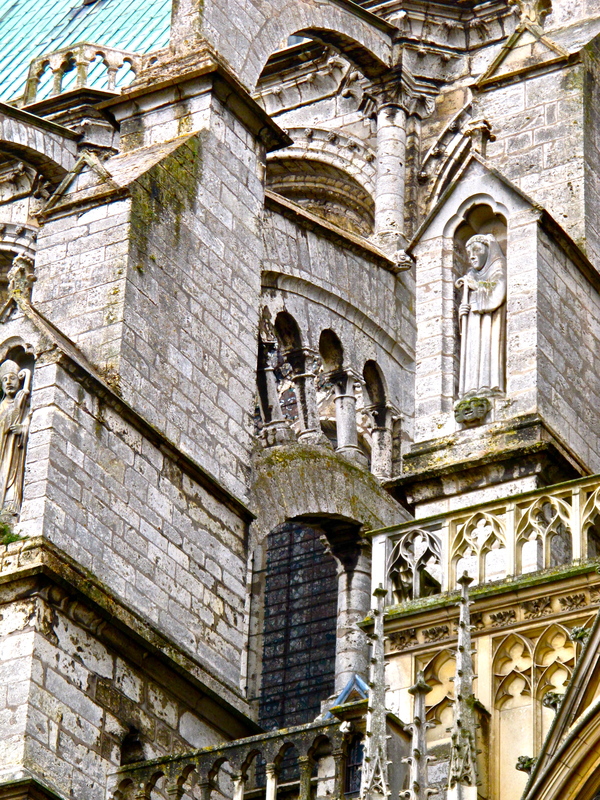 The name of the Master Architect at Chartres is unknown.